Stenhousemuir boss Brown Ferguson has been crowned Ladbrokes League 1 Manager of the Month after leading his side to an unbeaten November. Ferguson - who took over the reins in February - and his Stenny side hadn’t won in the league since September before turning things around last month. 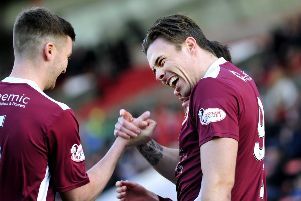 A victory over Peterhead at the end of October preceded two wins and two draws in lifted them up to fifth in the table. But the Warriors boss says his players deserve recognition for their efforts which have hoisted them up the League 1 table. Goal difference is now all that separates Stenny from the promotion play-offs, but Bomber is refusing get ahead of himself. He said: “I’m very pleased that the efforts of the squad and the staff behind them were rewarded for last month because we had a really good month in terms of results. “I’m honoured and, on behalf of the group of players and all the staff, I’m delighted to accept it. “I’m a greedy person who is always wanting more, but, as far as sensible objectives on the field, we’re looking for stability. “Moving into this season it was stability in terms of a position that keeps us in the league and stability in terms of recruitment of players moving forward. “If there’s a goal on the pitch it’s stability this season. Next up for Stenhousemuir is the visit of Albion Rovers to Ochilview and the league sponsors have them at 23/20 to win what is expected to be a tight game.